Khalid Sheikh Mohammed: "I beheaded Wall Street Journal reporter Daniel Pearl"
On Tuesday's Kelly File, Megyn Kelly led a discussion surrounding a multiple-page manifesto written by 9/11 mastermind Khalid Sheikh Mohammed, currently housed in Guantanamo Bay, Cuba. KSM's document was released by one American and one British news agency, and it was discovered that he has held a pen-pal relationship with a civilian in the United Kingdom. 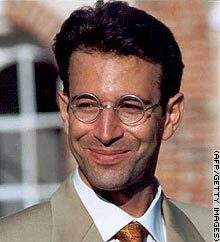 Wall Street Journal reporter Daniel Pearl was killed after being taken hostage in Pakistan in January 2002, while working on a story. WASHINGTON (CNN) -- Admitted 9/11 mastermind Khalid Sheikh Mohammed told a U.S. military tribunal he personally beheaded Wall Street Journal reporter Daniel Pearl in 2002, the Pentagon revealed Thursday. "I decapitated with my blessed right hand the head of the American Jew, Daniel Pearl, in the city of Karachi, Pakistan," said a Pentagon transcript of Saturday's hearing. "For those who would like to confirm, there are pictures of me on the Internet holding his head."